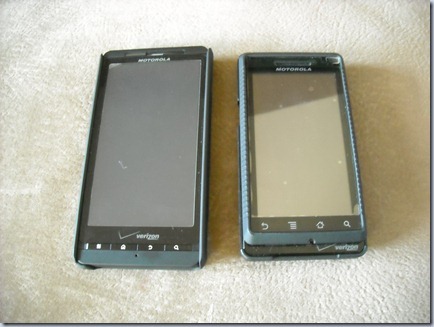 Droid X Review… iPhone Killer? I’m taking a break from SharePoint blogging to do a product review for you guys. I know, it’s hard to believe that I would have an opinion. So… I did something I don’t normally do. I waited in line to buy a Droid X on its release July 15th. I’m generally not the type to HAVE to have the coolest and the newest stuff. I usually just secretly hate those people and wait for prices to come down. However, this time I decided to steal my wife’s phone upgrade and jump on what I thought would be an awesome phone. First, let me say that this phone is NOT an iPhone killer. There is not a phone out there that will kill the iPhone. The Apple fan-boys will buy anything Apple throws out. I still don’t think a big iTouch is revolutionary AT ALL. The only iPhone killer out there is Apple itself, and they seem to be trying really hard at the moment to alienate their customers. OK, I’ll get off my Apple rant… By the way, I don’t hate Apple. I have an iTouch and love it and the only reason I have never bought an iPhone is because I have Verizon and not AT&T. I’ve used iPhones before and I owned a Droid previously to purchasing the Droid X. Everything being said, I would choose a Droid X over an iPhone (or Droid) any day. So, the obvious comparison is the Droid X vs its predecessor the Droid. The Droid is an awesome phone and I have been really happy with it. 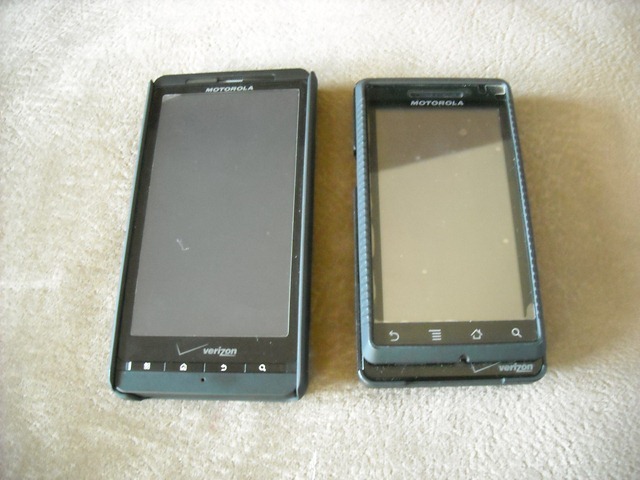 The screen on the Droid X is obviously larger and the regular Droid screen looks cramped by comparison (although it never felt that way prior to the Droid X). You lose the physical keyboard on the Droid X but the onscreen keyboard is larger and with Speech-To-Text I rarely use the keyboard anymore anyway. Your camera goes from 5mp to 8mp which is cool but don’t know if you’ll notice if you never take your photos off the camera. You get more home screens, more widgets, and more applications on the Droid X. You get HDMI output on the Droid X, but I haven’t tried it yet so can’t tell you how well it works. There’s a lot more differences like memory, and CPU speed, and others that I won’t go into because none have impacted me yet as an every day user. Although I will say that overall the Droid X seems to be more responsive and perform better. However, You still need to install some sort of application killer on the Droid X so you don’t accidentally eat up all its memory (which i did while playing around on it). There’s a reason why Apple didn’t want you multi-tasking. Overall the Droid X is a very solid upgrade to the Droid. So, let’s get down to some details. What’s good about the Droid X? I LOVE the screen on this thing. Everyone keeps asking me if the screen is too big. It’s not. Really, it’s the perfect size. It’s big enough that the screen doesn’t feel cramped but small enough to carry without feeling like you are lugging around a tablet. You can read web pages without having to zoom in and it feels great when you navigate using your fingers. The on screen keyboard is also improved because of the bigger screen. You won’t miss the physical keyboard at all. So, instead of three home screens like on the Droid you have seven home screens on the Droid X. At the moment I can’t fathom how I’ll fill them all up but I imagine in a few months I’ll wish I had 9 home screens. Definitely a big improvement though. Also the buttons on the bottom of the screen (settings, home, return, and search) are now physical buttons. It’s funny how such a small change can make such a big impact to user experience. It’s nice to be able to push the physical ‘home’ button to bring the screen back up instead of having to hit the power button. Oddly it gives the Droid X a much more polished feel. The interface has a lot of minor tweaks and a lot of new social networking integration that I have barely looked into as well. The mobile hotspot is a really cool feature. It allows you to use your Droid X as a wireless router for up to 5 devices. I have NOT tested this out yet as it costs $20 a month extra and I still use my work BlackBerry when I need to tether. Very cool feature though. As previously mentioned the camera on the Droid X is 8mp instead of the 5mp on the Droid (which I thought was awesome). Also, you can shoot video in HD which is cool but probably eats up your meager looking 16gb SD card. 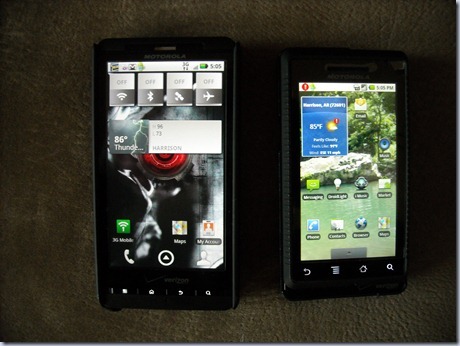 So yeah, Flash support is coming for both the Droid and Droid X on October 1st. This is huge and I hope it works well. Now if I could just watch Netflix movies on the phone and I’d be all set. I know.. I know.. you are supposed to be able to watch Netflix movies on the Windows 7 phone… if it EVER comes out??? So, there’s a cool Blockbuster application that allows you to rent and buy movies on your phone. Very cool concept and I tried it out by renting “The Book of Eli”. Except for the time needed to download (via Wireless only) it was a painless process. There’s a lot of potential here if they can figure it out. It’s not quite ready to conquer the world though. Of course there will be some cons as well, especially when you buy something the day it comes out! Some of these are actually pretty bad and might be bad enough for you to wait for Motorola and Google to work out the bugs. The speaker on the Droid X is not as loud as the Droid and I honestly think it is not loud enough if you have a song for a ring tone. I have no idea why they would have changed this as I thought the Droid had one of the best speakers in a phone I’ve ever heard. I LOVE the GPS on my Droid and used it all the time when traveling. I made the mistake of going on a trip the SAME DAY I bought the Droid X to a place I’d never been before. So, I was depending on the GPS to get to my location. I wasn’t concerned because I’d been very happy for the most part with the GPS on the Droid. Well, I used the voice search to tell the Droid X to navigate to my destination and it came up and I was on my way. While driving I noticed I hadn’t heard any update from my GPS lately and I looked down at it… It was locked up. Not only that, but I had to completely power it off to get the GPS back, and guess what? I missed a turn. I had to turn around and back track. I was NOT happy at all. Not only that, but the GPS locked up THREE MORE TIMES on the way to my location. If you rely on the GPS I’d wait for an update before purchasing the Droid X. Weirdly enough, the last time it locked up I hit the “back” button on the Droid X and it brought up an error screen. After I cancelled the error screen the GPS came back and it didn’t lock up again for the remainder of the trip. Still.. I hope they fix it soon. I was playing the MP3’s from the SD card on my Droid which contain many songs that I ripped from CD’s I OWN. There is a particular song that I ripped (from a CD I owned did I mention?) and when the music player tries to play the song I get an error that says “license expired” and the speaker turns off. No sound at all.. First of all, the license didn’t expire and second of all why do I have to turn the phone completely off and back on to get the sound back even it was a song where the license expired? I have no clue what’s going on here and it only happens with one song. So, maybe no one else will experience this problem, but if it happened with several songs I’d be taking the Droid X back immediately. So, if you are going to be making a device as cool as the Droid and Droid X you REALLY need to do a better job about creating a long lasting battery. When you see this thing you just want to play with it. Whether you are playing the demo of “Need For Speed” that comes installed or renting a movie from Blockbuster, you just don’t want to put it down. Well, be warned, that battery lasts about 3 or 4 hours with heavy use. The Droid had the same problem and I understand that it takes some juice to run the apps, WiFi, speaker, GPS, and light up the screen but it would be great if I could go through a day of “normal use” without having to charge it in the afternoon. So, the Blockbuster App is really cool, but not quite ready for prime time and so close to being something awesome. The HDMI output does not work for the Blockbuster videos, so you HAVE to watch it on the phone. Also, the price to “rent” or “buy” a movie is way too high. $3.99 to rent and $17.99 to buy. It’s REALLY hard to justify this cost when a RedBox movie is only $1 and popping up all over the place and it takes just as long to download a movie as it takes to drive to the said RedBox. Seriously Blockbuster, lower your price to be competitive and I’ll use it more often. It’s just much more convenient (and costs the same) to do Video on Demand on Dish Network or rent the move through the PlayStation Store. Also, you need a wireless connection to download a movie so you can’t download a movie at the airport while your waiting for a flight unless the airport has decent internet access. By the way, there is a cool RedBox application that will allow you to search and rent movies from local RedBox locations. This is not a huge concern to me because I hardly have the time to mess with hacking my phone. I realize this will keep some techies from making the purchase but I don’t think the mainstream consumer will care at all. Still, kind of interesting from a company that embraces open source to do something so draconian. As I already stated, overall the Droid X is a solid upgrade from the Droid with a lot of promise. There are several minor glitches which I’m sure will be patched soon and so far none that can’t be overlooked for a V1 (although the GPS issue comes close). If you are comfortable being an early adopter and expecting some minor issues, go out and get a Droid X today. You won’t be disappointed. If you are easily frustrated with technology though and don’t want to have any problems, then wait a couple of months just to be safe. Comments on this post: Droid X Review… iPhone Killer? # re: Droid X Review… iPhone Killer? I think that the Droid X is pretty sweet from a capabilities perspective, the only thing that I see as an added CON or perhaps a PRO depending on which tent your glasses are at the moment would be the size of it. In my hand it even seems big and I"ve been told that I've got sizable meathooks for hands. Other than that, it does seem that they've made some quite nice refinements. Congrats on the Droid X! Great review! Thanks! Have you had a chance to configure it with Exchange? If so, how is it working for you? Oh yeah! thanks for reminding me Lee... I never downloaded the Exchange app for my Droid that everyone told me I needed and I only got email from our exchange server, the calendar and other information never synced up. With the Droid X I DO get all of the calendar, contact, and emails from Exchange without any problems... definitely another Plus 1 for the Droid X. This was a great article comparing both droids phone not like other article that want to bring down the other products. I really like android phone. So I have an X on order, but now I'm debating it over the HTC. Any suggestions here? 1) When I use the Navigation App, the Droid-X heats up tremendously. 2) The battery is drained really quickly. I have had the same experience with the GPS and overheating. I have used the corporate sync and my email, contacts, and calendar sync perfectly. I even have access to our global contact list from Active Directory. I do love my phone! I miss the touch/soft "back" buttons found on iPhone apps. It has less "friction" than the physical back button on Droid X.